I’d read this week that Scott Carpenter had died. He was one of the original seven Mercury astronauts, and the second American to orbit the Earth. 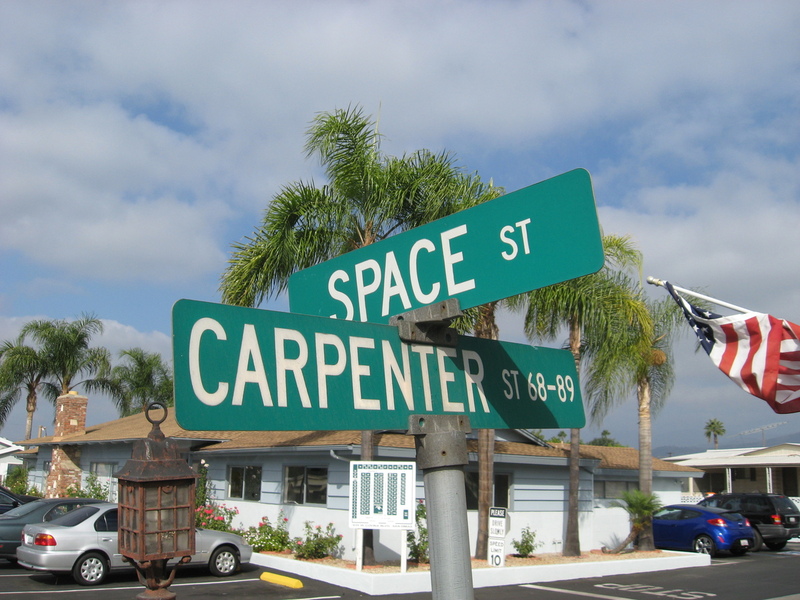 So in honor of this, this Sunday’s ride was out to the mobile home park in West Covina where the streets are named for the original astronauts. We’d gone there once before, back in 2009. The route was the old ‘Bagelry’ route, just reversed. We rode out on Gladstone St, which is a long, straight, slightly uphill street. All the way to San Dimas. Then we stopped for bagels. Then, on the way back, we stopped in at Mobile Land. The rest of the way home was down Cypress St, which is just like Gladstone, but going west, it’s slightly downhill. So that was nice. Then we came home by way of Santa Fe Dam and through Arcadia. It was a pleasant ride.